I recently picked up the audio version of this informative book to listen to while I work out at the gym. This was a great use of the dead time on the treadmill and elliptical machine. Things you will learn from this book can be summed up nicely with this statement: most of what you know about William Quantrill is wrong. For one thing, Quantrill’s service in the Missouri militia was intended to help the Union forces to police the actions of the “Red Legs” in its self-serving victimization of the Missouri people. The problem arose when the Federals not only were turning a blind eye to former Sen. Jim Lane’s renegades as they were robbing and committing numerous outrages across the landscape, but in fact began firing on Quantrill’s men when they attempted to stop Lane’s Red Legs. Despite this, Quantrill actually gave them multiple warnings before throwing in with the Confederacy, at which time he rode to Richmond and obtained a commission from the government. Also, something that doesn’t fit with the narrative about Quantrill is his swift punishment of any of his raiders who engaged in theft or harsh treatment of civilians. This seems surprising because of all that you hear about Quantrill and the raid on Lawrence, Kansas. The events in Lawrence are not to be admired, but this book gives you quite an understanding of the happenings that led up to the raid, including the much undermentioned jail house collapse that triggered the attack. When this is mentioned in official accounts, it is played off as a simple tragedy and due to the poor condition of the building. This book offers a deep look from an insider’s perspective. First, the women – several were fourteen or under – were all locked up there simply for being immediate family members of Bushwhacker leaders. Second, the building was selected for its poor condition and the second floor and first floor – which rested above a basement – were overloaded with the deliberate hope that it would collapse. Third, when the building did not collapse, digging was performed around the foundation to weaken it until the “accident” did indeed occur. Whether the digging to compromise the foundation actually happened, is something that neither side can prove or vindicate now, but the facts arise that in Quantrill’s camp, this was the belief of the soldiers. This was not speculation, this is what was reported to them and they believed it. 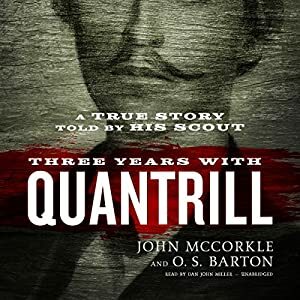 John McCorkle was a favorite scout of Quantrill’s. McCorkle started out the war serving under Gen. Sterling Price. He and his brother were captured and after some time, his brother had become so ill that McCorkle feared that he would soon perish. The McCorkle brothers then gave in and signed the oath of allegiance so they could go home and survive. That lasted for a while, but the Federals would not leave him along for long. The harassment started with charges being leveled against McCorkle for being overheard singing a pro-Confederate song as he went about his business. He paid a fine and soon found himself being faced with conscription into an army that he had fought against, but had agreed to sign the oath on the condition of neutrality. He was willing to agree to not take up arms, but was not willing to take up arms against his fellow Southerners. So, John McCorkle and his brother became soldiers once again. Much like the many states that were willing to stay neutral, but were ordered to raise troops by Lincoln, these states did raise troops, but not for Lincoln. So was the case of the McCorkles, they took up arms and joined with the Confederate Bushwhackers. Much of this time was serving under Col. Quantrill or under Capt. George Todd. This book is a who’s who of the Missouri border war and includes a number of people who are more famous for their actions after the war. McCorkle had extensive interactions with Cole Younger and Frank James. Jesse James also makes an appearance in the narrative, but to a lesser extent. An interesting thing about this book, is the heavy influence that it had on the book “Woe to Live On” by Daniel Woodrell and the subsequent movie, “Ride With the Devil” starring Toby McGuire. If you have watched this movie, you will recognize many of the archetypes of the characters and events from this book. The narration by Dan John Miller is very well done and keeps you listening and alert to the story. Highly recommended for anyone interested in this part of the war. In fact, if you listen to this book, you will become interested in this part of the war if you were not already.